Examining contested notions of indigeneity, and the positioning of the Indigenous subject before and beyond the law, this book focuses upon the animation of indigeneities within textual imaginaries, both literary and juridical. Engaging the philosophy of Jacques Derrida and Walter Benjamin, as well as other continental philosophy and critical legal theory, the book uniquely addresses the troubled juxtaposition of law and justice in the context of Indigenous legal claims and literary expressions, discourses of rights and recognition, postcolonialism and resistance in settler nation states, and the mutually constitutive relation between law and literature. 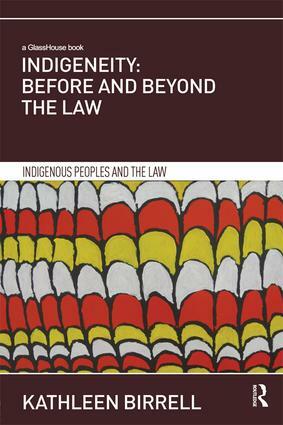 Ultimately, the book suggests no less than a literary revolution, and the reassertion of Indigenous Law. To date, the oppressive specificity with which Indigenous peoples have been defined in international and domestic law has not been subject to the scrutiny undertaken in this book. As an interdisciplinary engagement with a variety of scholarly approaches, this book will appeal to a broad variety of legal and humanist scholars concerned with the intersections between Indigenous peoples and law, including those engaged in critical legal studies and legal philosophy, sociolegal studies, human rights and native title law. Kathleen Birrell is based at Melbourne Law School, Australia.